The cost of living is the amount of money that is needed to sustain a certain standard of living. Given the diversity of backgrounds and incomes in the United States, what the cost of living is can appear ambiguous. One reasonably recent approach has been the calculation of what is now referred as the living wage. The living wage is calculated as the level of income required to enable a person to live a reasonable life in their geographic location. The diversity in levels of the living wage across different states suggests that the cost of living is considerably higher in Hawaii than in Arkansas. Another measure seeking to incorporate quality of life into the cost of living has been conducted to find the annual income requirement for comfortable living in the top ten most populous cities in the United States. The study suggested that someone in San Jose required 89,734 U.S. dollars per year, while someone in Houston required 60,795 dollars per year. The traditional method for quantifying the cost of living is to aggregate the prices of certain basic goods and services and compile indices that can be compared across different locations and over time. Such a method allows for more universally objective assessments. Such indices typically include prices for housing, food, health care and other goods and services considered basic needs. The downside of such measures is the absence of assessments on quantities of consumption and quality of life. A prominent example of a cost of living index is the U.S. Consumer Price Index (CPI) that is compiled by the U.S. Bureau of Labor Statistics based on prices of a certain market basket of goods and services across different urban areas. The cost of living in the United States is rising continuously. The 2016 CPI was 240 compared to an index value of 100 during the base period, between 1982 and 1984. Simply put, prices in the United States have more than doubled over the last 35 years. The fact that the CPI is based on a fixed basket of goods, and does not account for substitution between item categories, limits its suitability as a measure of the cost of living. That is why the Bureau of Labor Statistics introduced the Chained Consumer Price Index. Based on the same bundle of goods, it allows for substitution between categories and is thus considered a more accurate indicator for changes of the cost of living. Despite rising prices, the United States does not have the highest cost of living in the world. 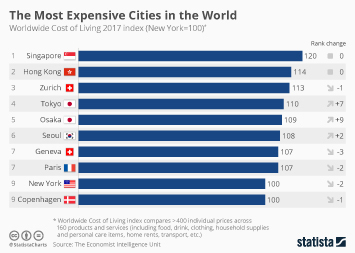 The Economist’s Big Mac Index suggests that the country with the highest cost of living in 2017 was Switzerland. However, the cost of living appears much more problematic in Nairobi if labor remuneration is taken into account. Percentage of change in average annual consumer expenditure of consumer units in the U.S. Median asking rent for unfurnished apartments in the U.S.